Order Bio D Fabric Conditioner Juniper from the Online Health Food Store UK. 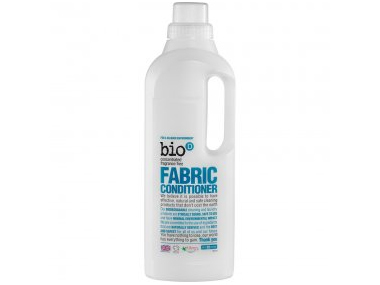 Buy Bio D Fabric Conditioner Juniper - 1litre and other quality Cleaning & Laundry safely online in the UK. Our effective conditioning formula and the rich, lively scent of fresh juniper combine in this fabulous Fabric Conditioner, which protects fibres and leaves your laundry soft and static-free. Suitable for use in automatics, twin-tubs and for conditioning delicate fabrics by hand. As official Bio D stockist in the UK, we sell quality Cleaning & Laundry to customers throughout the UK in England, Wales, Scotland and Northern-Ireland. Where to buy Bio D Fabric Conditioner Juniper safely online? Shop at the Online Health Food Store if you are wondering where you can buy Bio D Fabric Conditioner Juniper - 1litre safely online in the United Kingdom. Our Health Shop is located in the UK and our award-winning independent has been serving customers in England, Wales, Scotland and Northern-Ireland since 1976. You can buy our Hypoallergenic, vegan and environmentally friendly cleaning products and other quality Cleaning & Laundry online and we post out orders to any UK address.